Billionaire Ransom is a wonderfully ridiculous film that mostly stars actors from the CW. Kyle (Jeremy Sumpter) meets Amy (Phoebe Tonkin) at a party where they both get wasted and decide to leave together. He wrecks the car and then leaves the site of the crash without checking whether she's all right. This makes things very awkward when they get sent to the same tiny reform school on a Scottish island. Fortunately, the school teaches everyone survival skills, which the spoiled scions will need when a trio of mercenaries attacks the school to kidnap the kids for a billion dollar ransom. 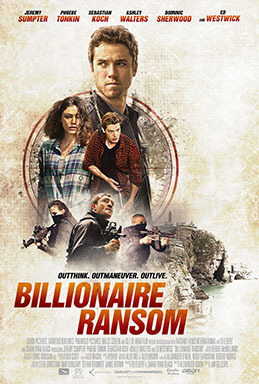 The group of students and teachers is international, but Billionaire Ransom makes the odd choice to have Sumpter speak with an American accent. (Sebastian Koch, who plays his father, doesn't.) Sumpter has obviously been acting since he was a child, making his big break in Peter Pan. If I didn't know that, I might think this was his first film due to the strangeness of his line readings. Letting him keep his accent might have helped. Despite her prominence in the marketing materials, Phoebe Tonkin is mostly on hand to be a damsel in distress. (She does get one cool, if gory, action scene.) The focus is weighted much more towards Kyle than Amy. As goofy as Billionaire Ransom is, I thought the growing camaraderie between the rich kids was done well and seeing them battle the mercenaries was fun. One of the mercenaries is even portrayed somewhat sympathetically, although the other two are cartoonishly evil. Ed Westwick, at least, gives good Eurotrash. I'm not going to convince you that Billionaire Ransom is a good movie, but luckily it isn't even aiming for that status. What it wants to be is a fun movie, one that you want to watch late at night with some snacks and a few friends to unwind for the weekend. It accomplishes that just fine. Wait, Sumpter IS American isn't he? Anyway, I'm glad this one worked for what it was!